When we die now, we leave a multitude of digital relics behind, said writer Luke O’Neil. Can we grieve properly for those we love when the dead remain with us? I DON’T REMEMBER the final conversation I had with my father. Toward the end of his life, he was hard to understand on the phone, as years of substance abuse and failing health had garbled his voice. He’d call at inopportune times—from a rehab center or hospital on Cape Cod, or the home of a friend in Florida he had somehow charmed his way into—and I’d hurry to get off the phone. Sometimes I’d find myself annoyed by his attempts to reconnect, and let the call go to voicemail. It had been more than 15 years since we’d had anything resembling a normal relationship, and more than 30 since he and my mother had. Even in my frustration, though, it was hard not to think of his looming existential deadline. I may never get the chance to talk to him again, I’d say to myself. I always did. Until, of course, I didn’t. Reading other texts from around that time makes me laugh: “i feel like such lo gool o gohurrf horp,” he wrote. “,,ro jlpw up pi f.” I still have no idea what he was talking about. And then in February 2016, the last message I’d ever receive: “hello my son how you doing today i have been in the hospital for two weeks now but I’m getting better TALK TO you Soon love Dad.” Three months later, he died of sepsis. I was thinking about those texts during a family dinner at my mother’s, not long after my father’s death. Someone had asked about a wall of photos that functions as an ad hoc memorial to assorted ancestors on my mother’s and stepfather’s sides, all mustachioed, bonneted, and stoic. The Wall of the Dead, we joked. But it occurred to me that the pictures are different from my father’s text messages—as are the letters I have stashed away from my beloved grandmother, stuffed with newspaper clippings she thought I’d like and uncashed $5 checks for “pizza.” My wife just found one in which my grandmother tried to persuade her to get me to give up on writing and find a real job. Those artifacts are moments frozen in time, part of my distant past. Our phones, on the other hand, are tools we live with every day. I could respond to my dead father’s final text right now, adding to the running conversation. 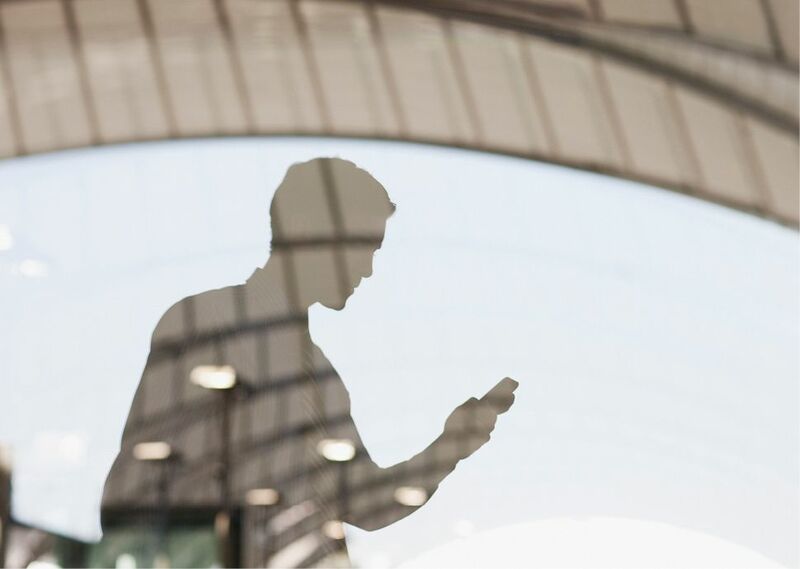 Our devices are where we carry out the business of living our lives and are increasingly our primary means of communicating with the people in them. Should they also be where we lug around our memories of the deceased? More to the point, do the digital ghosts the dead leave behind make it harder to let them go at all? The idea that the dead can speak to us feels like something from a horror or sci-fi movie. Yet the reverse, talking to them from the here and now, whether through prayer, quiet reflection, or even speaking out loud—You’d love this, wouldn’t you, Ma?—doesn’t seem strange at all. Keeping our loved ones stored in our smartphones, often not deleting their contacts for a long time after they’re gone, has made this even easier to do. We ask our devices for directions home, to bring us food, to broadcast our entire selves to the world. Now they’re also boxes we carry around that store our conversations with ghosts. When we spoke, Angier’s father was dying of cancer and she was preparing his digital memorial, saving everything. “On my birthday,” she says, “I asked him to leave me a voicemail singing ‘Happy Birthday’ to me, so I’d have his, too. He mistimed the recording, and all that’s there is ‘…to you!’ followed by a minute of silence.” He’s since passed away. Do digital ghosts leave us frozen in mourning? BY SOME ESTIMATES, 8,000 to 10,000 Facebook users die every day. What survives is a trove of digital footprints, including posts, messages, and pictures. So where does it all go? Turns out you can name an account executor, presumably a close friend or family member, to come in and tidy up your social media belongings in the event of your death, although that person will not be given access to your private chat logs. Immediate family members can also select the option to memorialize the account, turning off certain features, such as birthday reminders, which many users report are exceptionally painful to see. Gmail, meanwhile, has a tool called the Inactive Account Manager that lets you tell Google what to do with your account after you have stopped using it for a certain amount of time. Before the deadline, Google will reach out to see if you’re still there, checking your digital vital signs. If you don’t respond, it will contact your preselected trusted contacts with a message you’ve written. “Hey man I’m dead lol. Don’t look at my nudes, please,” or something to that effect. And Twitter has the option to remove the account of a deceased family member, but only if you submit official proof of death—not exactly a breezy ask when you’re grieving. Which brings me to my next point: As technology advances, it promises to change the very nature of how we mourn our loved ones. In Wired last year, for instance, writer James Vlahos documented his final few months with his father, during which he tried to capture the idiosyncrasies of his dad’s voice and upload it into an artificial intelligence chat software he called the Dadbot. It was an attempt to effect a sort of immortality—a concept many are working on around the world, and one sure to be improved upon. One company recently made headlines by promising to preserve your brain and upload it to the cloud—a cool idea, except they’d have to kill you to do it. Being able to hear from their mother will likely be a salve to their children, but it’s worth asking: How can we ever move on in this brave new digital era if the dead are never truly gone? IT’S BEEN A couple of months now since I first reopened the texts from my father, and I’ve been looking at them again, swimming in the absurd melancholy of it. I could do the same with others who’ve died, but it would take an extra step, rummaging around in old photo albums and digging through letter boxes in the back of the closet. Now, in the time it takes to look up a movie schedule or restaurant menu, I can call up the history of my relationship with my dad. 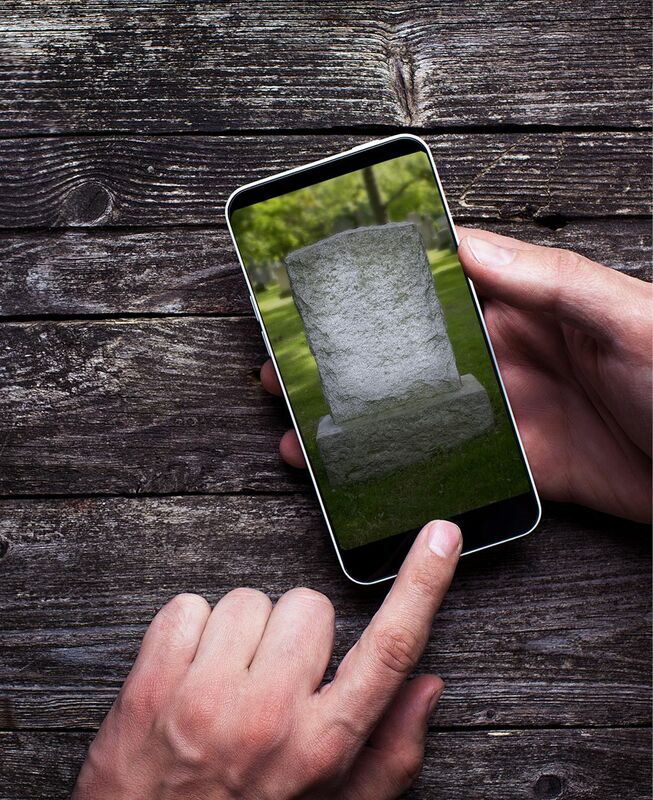 Our digital mourning isn’t nearly as separated from our everyday lives as the experience of visiting a graveyard or holding a physical letter or photo. Such a ritual “is an act that has space and takes its time,” says Elsa Ronningstam, a clinical psychologist at McLean Hospital outside Boston. “That has been part of our human lives for many, many years.” The ease with which we can access memories of lost loved ones on our phones or social media accounts, on the other hand, may end up trapping us in our grief. I suspect that when it is studied, we’ll find that phones have vastly complicated, and perhaps even forestalled, our ability to grieve in a natural fashion. Even after all of these interviews and the hours I’ve spent thinking about my father’s texts, it’s not entirely clear what they mean to me, or if they even mean anything at all. Contending with the digital end point of a relationship with a person who was a constant and loving part of your life for a long time is a lot different from when it is a reminder of someone who was absent. I can no longer call my father on the phone, but that was true for most of my life anyway. Perhaps I should have done so more often. Perhaps he should have. Every text I have now is a reminder that neither of us bothered to. I feel guilty about that. In part that’s because he had the foresight to die before my loving stepfather, hogging all of my good “my dad died” writing before the man who actually raised me could get the chance. I wonder if he was capable of thinking about any of this stuff in the last week or two he spent in a medically induced coma at the hospital as his children and exes re-emerged to say goodbye one final time. It was like a dress rehearsal. We were talking to him, but he couldn’t talk back. I guess I’m doing the same thing now. Although we still cannot speak directly to the dead, these days they can call back out to us. And what they say, whether it’s in a voicemail, a text, or a tweet, is the most important message any of us will ever be able to convey: I was here. I am gone now, but I was here. I just went back and looked at one of my last text messages to my father, sent shortly before he stopped responding. “Hi dad was planning on calling soon,” I wrote. “Glad to hear you’re well.” I wonder how long he saved that one from me? Probably right up until the end.